Man's sterling silver turquoise ring inlaid with black onyx and blue spiderweb turquoise with black matrix. This silver turquoise ring by Mark Hileman measures 9.5mm wide at the top and is shown in a size 10 1/4 for scale. This ring would also make a nice alternative wedding band and a matching wedding ring set could be made by special order. This ring will be made to order in your ring size in 3 to 6 weeks. The ring can be inlaid with other stone choices and may be made in 14k gold or stainless steel by special order for an additional charge. Contact us for details. We recommend upgrading to Continuum sterling silver for all wedding ring and heavy wear jewelry. Continuum silver is much more durable than standard sterling silver and is highly tarnish resistant. Check the "Continuum Silver Upgrade" box below below your ring size to add this option. A woman's version of this ring style is available here. 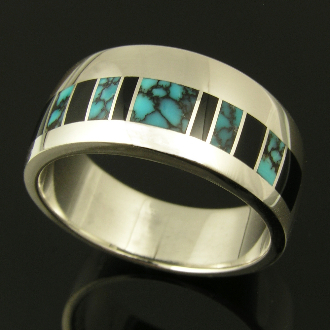 See photos of our sterling silver turquoise jewelry on Flickr.com.